Basseterre, St. Kitts, February 12, 2019- In a brief yet symbolic meeting held on Monday 12 February, 2019 between the Minister of Foreign Affairs and Aviation, the Honourable Mark Brantley and the Executive Director of the EU- LAC Foundation, Mrs. Paola Amadei, Minister Brantley made the announcement that the Federation was delighted to have recently ratified the Agreement that established the EU- LAC Foundation, as an International Organization. 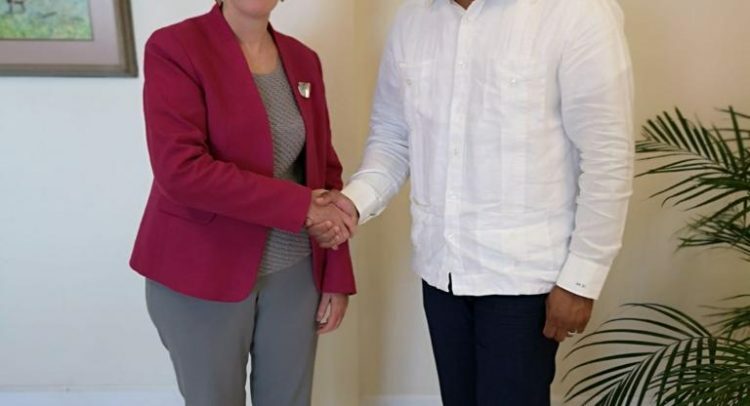 Executive Director Amadei, whilst on her first official visit to the Federation, welcomed the news and thanked the Government of St. Kitts and Nevis for reposing its confidence in the Foundation, with the ratification. Mrs. Amadei also praised the Federation for being the first OECS country to ratify this important document, paving the way for other territories from the region. St. Kitts and Nevis’s ratification is indicative of the country’s commitment to further strengthen and deepen relations between Latin America and the Caribbean and the European Union, as both regions continue to work collaboratively to advance the lives of their people, through the exchange of knowledge and mutual cooperation. The European Union – Latin America and the Caribbean Foundation (EU-LAC Foundation) was created as a result and initiative of the VI Summit of Heads of State and Government in May 2010 and formally began operating in November 2011. The aim of the Foundation is to transform and adapt the strategic partnership between the European Union, Latin America and the Caribbean -adopted in 1999 – into a strengthened and visible reality where the respective societies in both these regions can actively participate. The EU -LAC Foundation continues to promote understanding between the peoples of Latin America and the Caribbean and the European Union, strengthen cooperation between the EU and LAC states, foster Intercultural exchange, through the participation of civil society and social actors, encourage greater mutual knowledge and understanding between the two regions, enhance visibility and presence in the partner region as well as the profile of the bioregional partnership and seek to advance the knowledge of art, culture, history, languages, customs and traditions, political, economic and social conditions of the two regions. The seat of the EU-LAC Foundation is in Hamburg, Germany.